Nels and Tom Qualey (aka Qualey Bros) were brothers born in 1903 and 1904 respectively. They grew up on a ranch in Joseph Plains, Idaho and learned general blacksmithing as well as bit and spur making as children, along with their brothers who didn’t show much interest in the craft. Tom Qualey was the most skilled at bit and spur making, but he and Nels made bits and spurs in their spare time away from working the ranch for around 20 years starting sometime in the 1920s. In 1942 the family sold the ranch and the brothers moved apart, Nels moved to Slate Creek and stopped making bits and spurs, while Tom Qualey moved to Cottonwood, Idaho where he built houses for a living but continued to craft bits and spurs that were sold through local businesses. In 1948, Tom went to work for Ray Holt in Grangeville where he worked for many years. 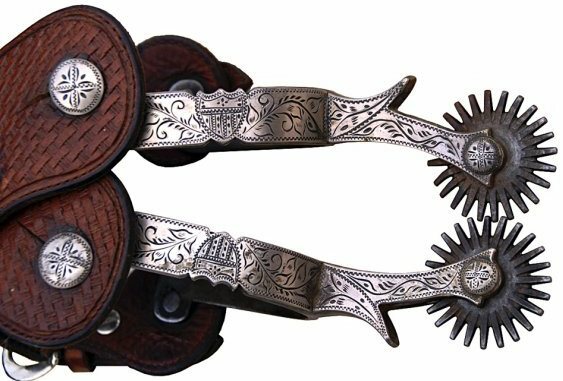 For more information about Qualey marked spurs please Contact Us for appraisals and identifications. Click here for information on Qualey Bros. Maker’s Marks.